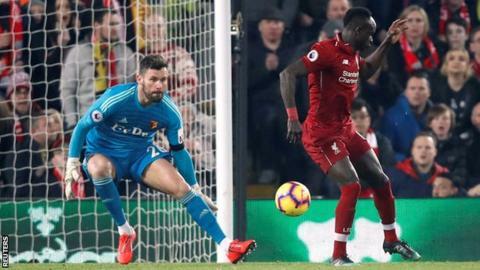 Liverpool stayed a point ahead of Manchester City at the top of the Premier League after thrashing Watford at Anfield. Sadio Mane and Virgil van Dijk scored two apiece, with Divock Origi grabbing the other to send Jurgen Klopp's side to a resounding 5-0 win. City had a harder time at home to a resilient West Ham, with Sergio Aguero's second-half penalty giving them a 1-0 victory. Chelsea manager Maurizio Sarri dropped goalkeeper Kepa Arrizabalaga, but still saw his side beat Tottenham 2-0, thanks to Pedro's opener and an own-goal from Kieran Trippier late on. Spurs stay third, nine points behind Liverpool, while Chelsea remain in sixth place. Arsenal kept themselves a point ahead of Manchester United in the race for the Champions League and fourth place with a comprehensive 5-1 win over Bournemouth. Mesut Ozil and Henrikh Mkhitaryan put the Gunners ahead, but after Lys Mousset pulled one back, Laurent Koscielny, Pierre-Emerick Aubameyang and Alexandre Lacazette gave Unai Emery's side an emphatic victory. Manchester United stay fifth after a 3-1 win away to Crystal Palace. Two from Romelu Lukaku either side of the break came before Joel Ward pulled one back, but Ashley Young's fierce finish ensured three points for United in the closing minutes. At the other end of the table, Southampton moved out of the relegation zone with a 2-0 win at home to Fulham. Goals from Oriol Romeu and James Ward-Prowse before half-time were enough and leave second-from-bottom Fulham 10 points from safety. The Premier League returns on Saturday, 2 March, when Spurs host Arsenal at 12:30 GMT.